Miners at South Africa’s Amplats have returned to work after a brief wildcat strike, according to a statement from the company. Five-thousand six-hundred miners at Anglo American Platinum demanded that the company reinstate 19 Association of Mineworkers and Construction Union (AMCU) members that were dismissed last week for orchestrating a protest which the company deemed “illegal”. The company said the striking miners, accounting for 11 per cent of workers at the mine disrupted production and that the stoppage was “unauthorised”. Labour relations are tense in the country with South Africa’s two major unions AMCU and the National Union of Mineworkers (NUM) demanding higher wages and a scrapping of job cuts. 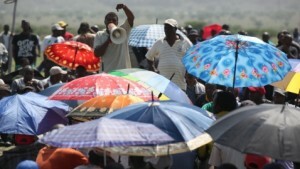 A series of wildcat strikes disrupted South Africa’s mining sector last year. Forty-four people died in mining related violence last year. The South African sovereign debt was downgraded by 3 credit ratings firms following the violence in 2012. Anglo American Platinum is the world’s largest platinum producer.